Uncovering the inherent isomerization mechanism of azobenzene driven by an electric field on the platform of graphene-molecule-graphene single molecule junctions. Azobenzene-derivatives have been widely studied for their reversible isomerization between trans and cis forms under the irradiation of visible (Vis) and ultraviolet (UV) lights, where the trans form is nearly planar while the cis isomer adopts a bent conformation out of the plane. Single-molecule junctions provide a platform to explore the inherent physical characteristics at the atomic scale by tracing the junction conductance in real time, which are inaccessible in bulky materials. After sandwiched on nanogapped electrodes, its isomerization process of azobenzene can be traced in real time by reading the junction conductance. 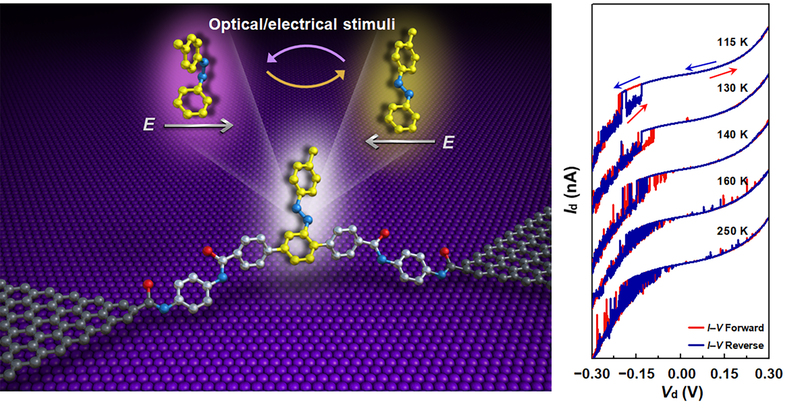 Based on single-molecule junctions, previous works suggested that other than external light stimuli, resonant or inelastic tunneling of electrons or the electric field could trigger the isomerization of azobenzene as well. In this work, individual 2′-p-tolyldiazenyl-1,1′:4,4′-terphenyl-4,4″-dicarboxylic acid (TTDA) molecules, which contain an azobenzene sidegroup as the molecular bridge, were immobilised on nanogapped graphene electrodes to create graphene-molecule-graphene single molecule junctions. Surprisingly, we achieved the reversible switching between two states driven by photon and electric field. In addition, the combined experiment and calculated results consistently revealed the mechanism of the isomerization process driven by an electric field. Due to the opposite directions of the projected dipole moments along the terphenyl backbone for trans and cis forms, the additional energy caused by electric field of the two conformations are different. Ultimately, the electric field could tune either of the two conformations as the stable state by adjusting the energy alignment between trans and cis forms. Except the stable states, the energy barriers for the two dynamic processes as a function of the bias voltages were carried out experimentally. The modulated energy barrier can be explained with the transition state in the same way that electric field can adjust the energy of the transition state to raise or lower the energy barrier. This material is provided by Linan Meng, Na Xin and Xuefeng Guo. So glad to see your behind the paper on the community!